The "Green Mountain Boys" were militia largely in the area of what is now Vermont but which in 1775 was territory called the New Hampshire Grants and claimed by the state of New York pursuant to an order of the British government that the territory was property of New York rather than New Hampshire (Vermont declared its independence in 1777 and was admitted to the Union in 1791). These men were staunch defenders of independence from the control of the New York state's government and seem to have taken active steps to prevent the exercise of the state's authority (taking pot shots at surveyors, that sort of thing). The Green Mountain Boys' founder and leader was Ethan Allen, who in May 1775 led some 200 of them in the expedition against Fort Ticonderoga and other British posts on the Canadian border. Seth Warner, Allen's cousin, was also involved in that operation. 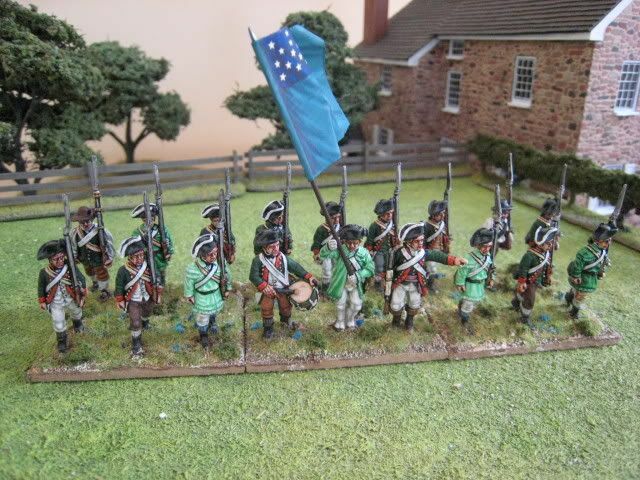 In June 1775 Congress authorised a regiment to be raised from the Green Mountain Boys for service in the Continental Army. Further to a local vote, command was given to Seth Warner rather than Ethan Allen, much to the latter's disappointment. The unit was an "Extra" Continental regiment rather than an "Additional" one like Henley's Additional Continental Regiment, for example. The regiment returned to Canada for continued operations, but suffered during the winter and as a result of a smallpox epidemic and was down to a hundred effectives by March 1776. The following year the regiment was heavily engaged in the Saratoga campaign, notably at Hubbardton and Bennington. During 1778-9 the regiment operated in the Lake George area. It seems that recruiting became a problem, largely due to political interference, and the regiment was disbanded in January 1781 as part of the wider re-organisation of the Continental Army. 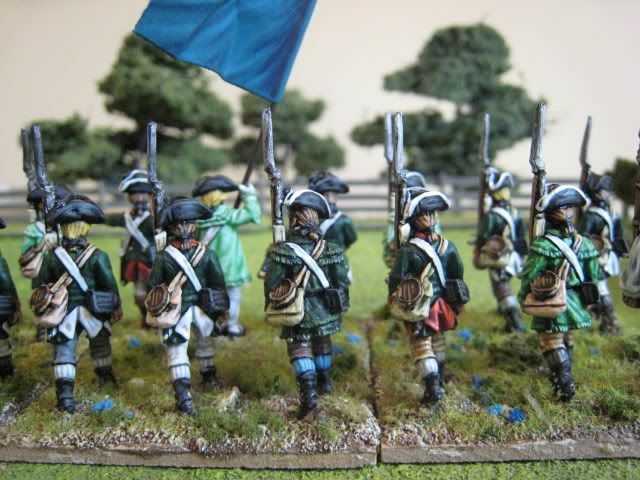 The direct inspiration for painting this unit was the website of the re-enacted regiment, here. I was immediately taken with the photo on the main page of men in a variety of clothing, but most of it green of some hue or another. Of particular interest were the light green, pistachio-coloured hunting shirts; I have seen pictures of dark green hunting shirts, for example on the 1st Continental Rifle Regt., but not of such light ones. The photos also show differently-cut uniform coats, some with white turnbacks and some with red ones, and men in civvies or shirtsleeves. So I decided to paint the figures as shown in these photos - a mix of hunting shirts of various shades of green and uniform coats, with a couple of new recruits in civilian clothes or perhaps just a green waistcoat. The idea was to capture a unit with troops wearing a combination of different issues of clothing, but which keeps green as a unifying colour. So the uniform coats have subtle differences in colour (you can't really see on the photos, but some have brighter highlights than others), and the hunting shirts were all painted with different mixes of green. This approach seemed a good one for representing the regiment as it might have looked during the Saratoga campaign - some old sweats from the Canada expedition wearing faded hunting shirts and coats and new recruits in freshly-dyed ones. 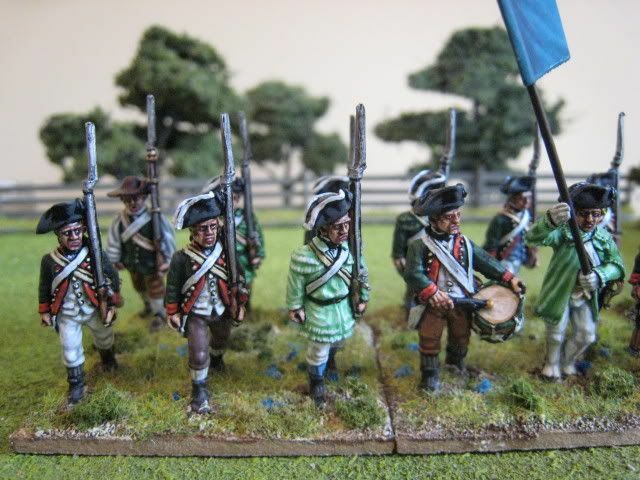 I went for 18 figures because the Hubbardton scenario in the second "British Grenadier!" scenario book requires the regiment to be split into two wings of 18 figures each (this scenario is at 1:10 troopscale). 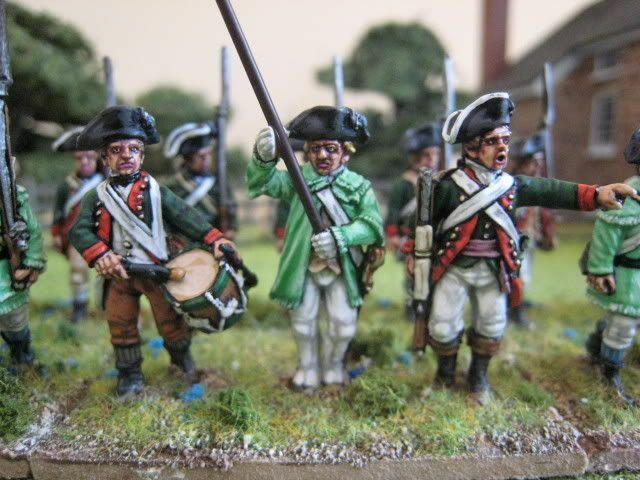 At some stage I will have to paint a second 18-figure green coated regiment for the other wing. These are all Perry Miniatures figures. The colours used for the coats were the Foundry "Bright Bottle Green" palette with additional highlights to a varying degree of "Bright Green". The pistachio hunting shirts were painted with "Bright Green C" mixed with a lot of white. 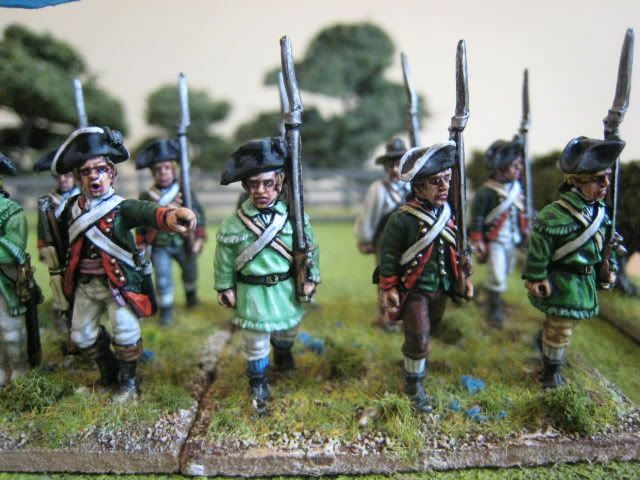 The other hunting shirts used the darker "Bright Green" colours mixed with "Forest Green" and some of the new Napoleonic greens. My favourite hunting shirt colour is actually the chap behind the drummer - this was painted with the "French Chasseur a Cheval Green" and "French Dragoon Green" palettes, and is the colour I'll probably use for the 1st Continental Rifles. Some of the breeches and waistcoats also use the new Foundry "authentic Napoleonic" colours - I might review these in detail when I next paint a militia unit; my initial impressions are rather mixed, as quite a few of the colours are useless (either because the paint is so thin, there is no difference between the shades or the tones are simply too dark). The basing has a sprinkle of "bluebell" scatter from Realistic Modelling, which shows up mainly as lumps of blue. I pulled some of this off with tweezers after taking a couple of photos as the clumps of blue seemed far too large for patches of blue flowers. It may be a bit ott, but at least the blue blends in with the general colour scheme of this unit. 18 figures. Painted February/April 2009. Flag by GMB. It takes guts to go with the lighter sun-faded hunting shirts, but I think you pulled it off well. You can't ALWAYS trust reinactors to get everything right, but in this case I think both the reinactors and your figures are spot on. You just get better and bettr Giles! A very unusual but effective looking unit! Very nice indeed - and the views from behind are even better than the one's from the front..
As said before: tough choice on the flashy hunting shirts - but surprisingly they turned out very well when distributed among the unit. I'm also happy to see "Bright Bottle Green" used and being such a nice colour (I've bought it blindly). Besides, have to second legatus' comment on your ever-growing excellence. Top-notch, sir! Which of the new Foundry Napoleonic paints did you find to be least useful? I've only bought British Redcoat but have gone back to GW Dark Flesh\Vallejo Flat Red\Vallejo Scarlet which I prefer. The French Blue looks like it might be ok but I've yet to try it. Very nicely done Giles, as always, and an interesting history lesson too. Quality! What size are the bases you use? They look very nice indeed!I like the color scheme a lot,and I'd love to give it a go sometime myself. My name is Jake Conaway and my lineage can be traced back to Ethan Allen who was my great(7 greats) grandfather. I would be Interested in purchasing these figures if you would be willing to sell. This would mean a lot to me.